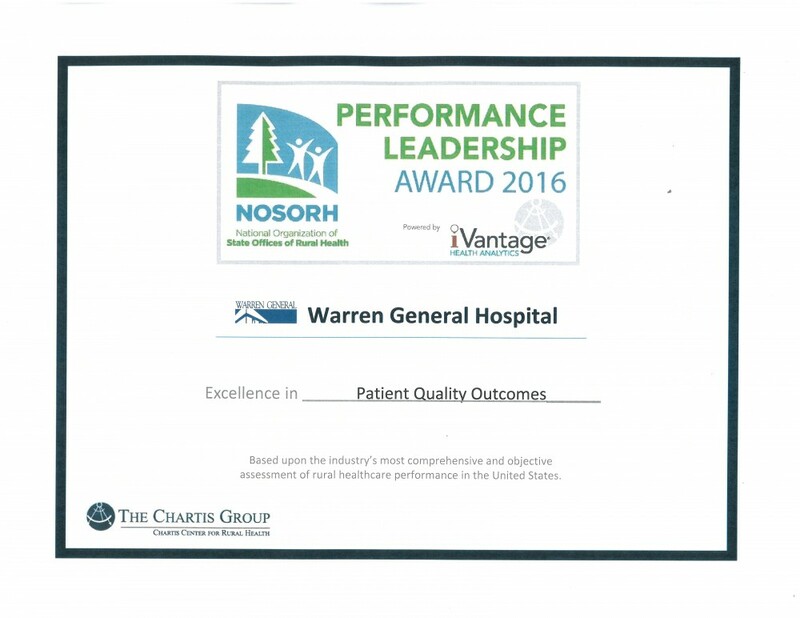 Warren, Pennsylvania, November 29, 2016 – Warren General Hospital today announced it has been recognized by iVantage Health Analytics and the National Organization of State Office of Rural Health (NOSORH) for overall excellence in Outcomes, reflecting top quartile performance among 4,000 rural acute care hospitals in the nation. “These top quartile performers should take great pride in this recognition. It showcases their commitment to continuous performance analysis and improvement. On this occasion of National Rural Health Day, it’s an honor to celebrate their achievement as they continue to serve their communities despite the many market, regulatory and financial pressures they face.” said Michael Topchik, National Leader of the Chartis Center for Rural Health.